This page is all about running, about world records from sprint to ultra marathon but also about what everybody might be able to achieve. It is organized reversely with the result at the beginning. And the result is a running time prediction calculator, which you can find HERE. Note: if any of the formula images are too small, click on them and they will be shown enlarged. with the average running speed v, the distance S; S0 as a parameter to get rid of the dimension (meter) I chose it to be S0 = 100 m and v0 to get the dimension of speed. a and b are parameters to be gauged from data, i.e. known running times for two different distances. They are dimensionless numbers due to the construction of the rest of the equation. 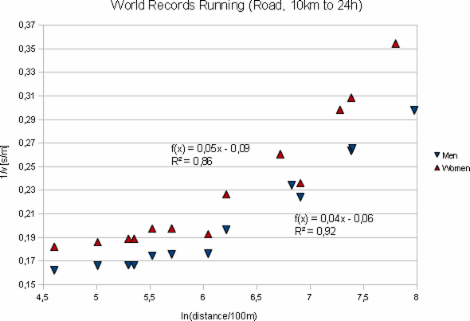 v0 does not necessarily have to be the speed with which you can run the distance S0, but if it is then b = 1. Still, it might be simpler to use v0 = 1 km/min or v0 = 1 m/s. Here LW is the Lambert W function. 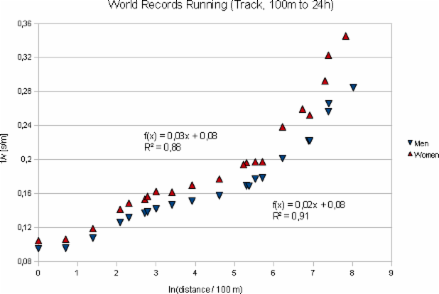 When I first was thinking about such a relation and from my own running times had this idea, the first data I could grab were the world records as shown in figures 1 and 2 (world records of all following diagrams are as of January 2010). Fig. 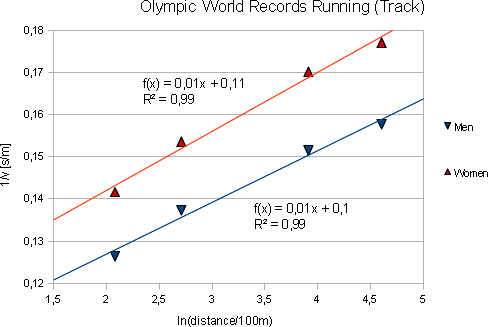 1: Running World Records on the track, displayed 1/speed vs. ln(distance/100m). The two functions are the result of linear regressions. Fig. 2: Running world records on the street. If the initial equation was meant to be valid for all running distances from 100 meters to 24 hours (currently 303.5 km) then the data points of the four sets in figures 1 and 2 should align more or less linearly, which they obviously only do with some clearly visible deviations. 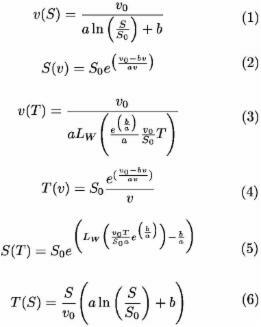 But could one really have hoped to describe the full range of running distances with only one single formula? Probably not. So, what are the relevant ranges, and what are the reasons for the deviations from linear dependence? At first one has to bear in mind that world records stem from more than one runner, what we want to do is predict times for one single runner from his own data. So, figures 1 and 2 show something different. But later more on this. Sprint is not of interest here. Don't try to predict your sprint times, just go out and try them. Olympic middle and long distances and ultra marathon are different in more than just the fact that ultra marathon runs and takes even longer. Competing in the Olympic disciplines means that you can earn much more attention, money, and recognition. This means that fewer people try to compete in non-Olympic disciplines than Olympic disciplines, that talent sighting is far less organized, and that there is by far less support for ultra marathon runners than for Olympic athletes. There are only very few professional ultra marathon runners, if any. And while you can make maybe 100 serious attempts per year at 800 m really fast and maybe 3 attempts at marathon, there are only very few people who can make more than one serious ultra marathon run per year (although I know there are a few). And if then you do not have your best day - bad luck, wait another year. All this in summary leads to the effect that the potential of the human body to run a distance really fast may have been best probed for 800 m (everyone has to do it in school and a teacher might suggest to a talent to join a club and train seriously). It may still have been tested quite well for marathon but then much less for any distance longer than marathon. There have been rumors going on that a race over 100 km will be part of the Olympics. Should this happen, the situation will change up to this distance. Therefore we have to assume that even if there is a common law that describes the running time in dependence of distance from 800 m to 300 km, it does not yet show in the data. Let's therefore concentrate on the Olympic distance range. 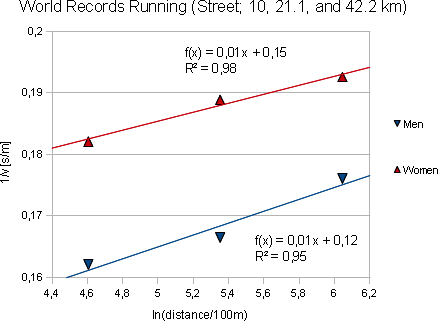 Figures 3 and 4 show the world records on track and street. Fig. 3: World records for 800 m, 1500 m, 5000 m, and 10000 m on the track. Fig. 4: World records for street competitions on 10 km, half marathon and marathon. 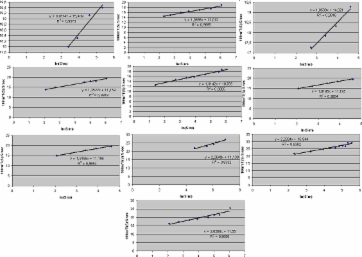 Figures 3 and 4 include only few points per data set, but at least in figure 3 one can see a better roughly linear dependence with a small negative curvature. In figure 4 there is a negative curvature for women and a positive one for men. 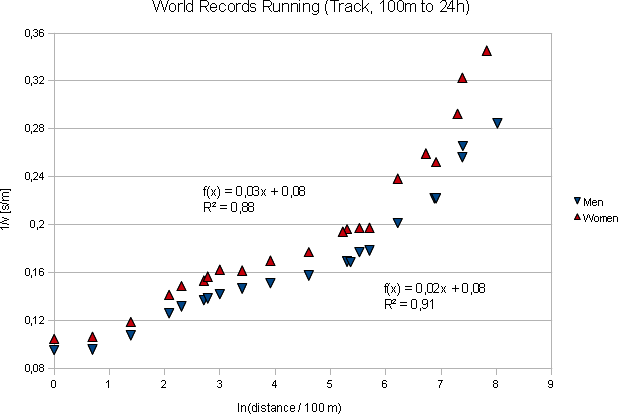 It could be that everything is due to statistical fluctuations, but I think the true reason is that the initial equation is correct and the curve of world records is the lower hull of many individual straight lines: sprinters have small values of 1/v at small ln(distance/100m) but a higher incline, and long distance runners vice versa. As a result of this the graph of world records - which by definition is the lower hull of all individual lines - has a negative curvature. 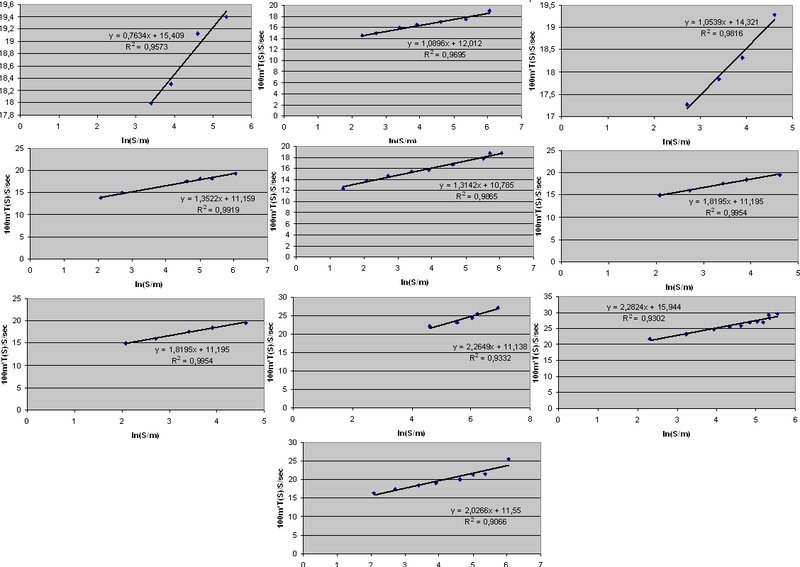 Two questions remain: does the initial equation really fit well the individual performances? And what's the reason for the positive curvature for male street runners? 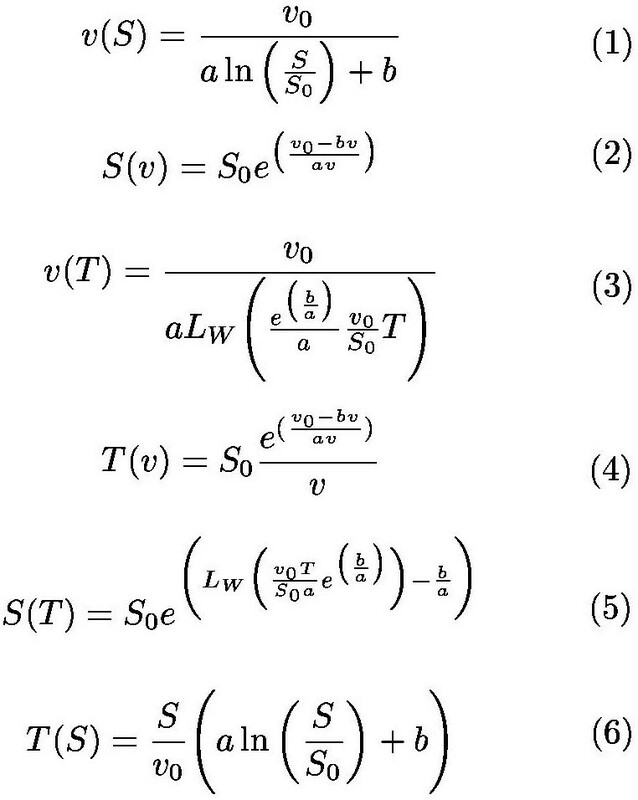 For the first question see figure 5 at the end of this page. There, data of individual runners is shown who have publised their personal bests on the web. In most cases the initial equation fits the data very well. 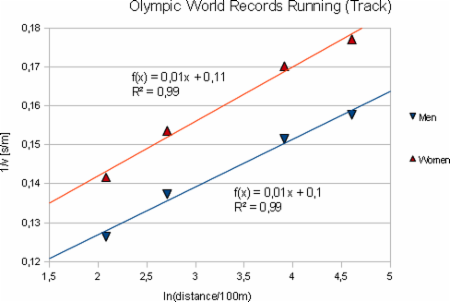 There are a number of conditions which can be told a priori, which is needed if the initial equation is to give good predictive results: A runner must check his personal best times frequently. It does not help if some data is up to data and others are not. Furthermore frequently checking the personal best time guarantees that the personal bests really give what is possible for the runner. And third: a runner must train for the distance which he is predicting his best time for. Only training 400 and 800 meter sprints might show you what you could reach in marathon, but it probably will not enable you to realize that potential. And a last thing: having been predicted your potential does not mean that you can realize your potential at the first attempt. It might well be that you will finish your first marathon 20 minutes later than has been predicted, just because it may not have been your best day. Fig. 5: (Click to enlarge.) Individual performance data found on the web. 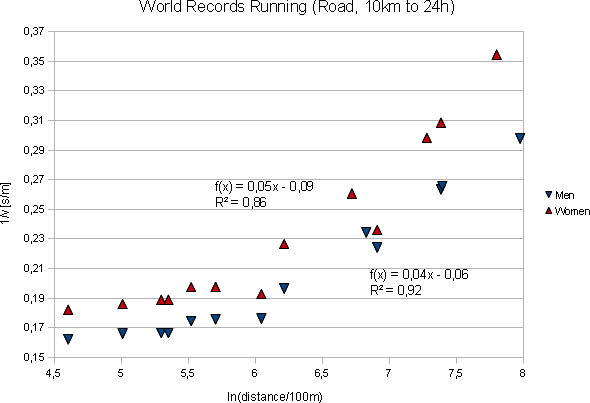 The dimension constants are chosen a bit different than in the rest of this page, but this should not obscure the fact that the initial equation fits well the data of most runners. Every runner who has been found publishing his personal bests on the web has been included in the set. So this is not a selected sub-sample.